Think seriously for a moment about how much culture you consume every day. This morning you likely started your day by choosing some clothing to wear, a pair of shoes, maybe some glasses—all of which have been meticulously designed by someone, somewhere. Perhaps as you were getting dressed, you tuned into your favorite music or TV station, or popped over to a social media platform to see what your friends were up to. As you sipped your first cup of coffee, maybe you surfed over to a favorite blog or web site, the content of which someone created, composed, wrote, edited, and produced before it was packaged for your screen by an army of graphic-, web-, brand-, and experience-designers. After your commute (by a bus, bike, car, train, or cab created by product designers), as you strolled down a typical urban street to the building where you work, you passed a mural or billboard, maybe a city park, each of which is the result of efforts by commercial artists, urban planners, architects, and landscape artists. Over the weekend, maybe you read that new literary magazine or book you read about online, or listened to a catchy music download; maybe you curled up with a favorite television show or video game, or took in a movie, concert, comedy show, play, or museum opening. Just like the food we eat (and often with the food we eat), creative culture surrounds us—it is ubiquitous and, because of that, partially invisible. Whether we realize it or not, a thousand times a day we make choices about what kind of cultural products to consume; behind all of them individual artists and the complex economic systems that employ their services and talents—or don’t, as the case may be. Thanks to the beleaguered economic climate in the United States, there is a new urgency surrounding the need for innovation, and a renewed interest in the importance of place. Communities and neighborhoods across the country share many of the same questions: How do we ensure both rural areas and cities in our area can thrive? What can we do to retain our region’s talent and distinctive color? How can our states better attract tourism? What can we do to encourage small business development and entrepreneurial spirit? How do we encourage cross-sector innovation and bring important attention to the causes we’re confident will make our neighborhoods stronger? I work for a nonprofit organization in Minnesota, Springboard for the Arts, dedicated to these concerns, and we believe the answer to these questions is really quite simple: Support and invest in local artists. However, we also recognize the lack of adequate existing systems to support and effectively employ creative workers, or that might easily bring the fruits of those artists’ efforts to a larger public that could benefit from them. We need to act quickly to create ways for an arts-hungry populace to navigate these cultural corridors; we need to educate ourselves as consumers, and we need grassroots mechanisms that will connect us with the artists working in our communities. There is a growing movement to do just that, which strives to connect people to the culture around them, and to do so at the source, by directly linking residents with local artists, and by cultivating an appreciation for regional varieties and specialties. For inspiration, we need to look no farther than what’s happening on small-scale, locally supported farms. The first time I encountered a community supported agriculture (CSA) operation first-hand was at the wedding of two dear friends in the Berkshire Mountains of Western Massachusetts in 2002. The couple had spent the summer interning on a small dairy farm, learning both the agricultural skills and business model and up to their elbows in manure and mud. The United States Department of Agriculture describes the CSA model as “a community of individuals who pledge support to a farm operation so that the farmland becomes, either legally or spiritually, the community’s farm, with the growers and consumers providing mutual support and sharing the risks and benefits of food production.” Community members invest in the CSA, partaking of both the bounty and the risks of production, through the purchase of seasonal “shares” in the farm. Years later, it’s now clear that community supported agriculture has not only proven to be a viable economic model for agricultural producers, but a bona fide social movement, as consumers increasingly invest, psychologically and financially, in “buying local.” In Minnesota alone, we have more than sixty independent agricultural CSAs. Minneapolis and Saint Paul also boast fourteen local and natural food co-operatives that collectively serve thousands of households. Next year, Minneapolis plans to revise the city’s zoning rules to accommodate urban agriculture, as the demand for local food production still outpaces the supply. We at Springboard for the Arts, along with our colleagues at mnartists.org, noticed the rapid growth in the local food movement, and we couldn’t help but wonder: Why couldn’t we tap some of this “buy local” enthusiasm on behalf of local artists and cultural workers? Surely selecting the cultural products we consume every day is as deeply personal and distinct as the food we choose to prepare and eat with our families. But would arts patrons prove willing to buy into the benefits and risks inherent in the artistic process? To test the idea, last year our two organizations partnered to create a community supported art program to support our area’s art and artists and to identify a group of patrons interested in investing in local creativity. For the project, we selected nine artists, each of whom received a $1000 commission to create fifty “shares” of artwork. 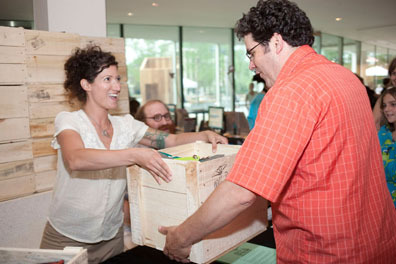 For $300, our CSA shareholders took home “farm boxes” packed with locally produced artwork over the course of three different CSA events in as many months. 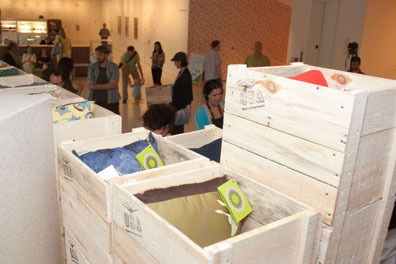 Featured art works in the box that first CSA season included pieces like an edition of vinyl 7” records, a run of screen-prints, a series of small, handmade tea cups, a run of limited-edition photographs, letterpress editions of a poem or short story, and small original paintings. The pick-up evenings were informal parties, meet-and-greets held at local food restaurants or art events, and these festive gatherings proved to be key opportunities for the artists and consumers to establish ongoing relationships with one another. We have been stunned by the robust public demand for a program like this. 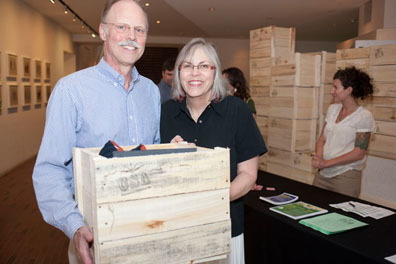 When we announced the first season of the CSA to the public, all fifty available “shares” sold out in less than eight hours; we quickly filled a waiting list with 150 additional households who wanted to participate in the future. Clearly, there is an appetite for locally made art that is not being fed. Just like independent farmers, artists have always struggled against the whims of their environments, harsh economic realities, and overwhelming competition from big business. As a result, individual artists tend to rely heavily on institutional support to make their work—through grants, fellowships, staff positions, contracts, and commissions. Usually, it’s only well-established artists who reap the benefits of a large community base of patrons and fans, and that’s something which can take years, decades, even a lifetime to build. Artists have fluctuating incomes and non-traditional career trajectories which, in turn, reinforce the commonly held notions that their work is rarefied, or that there’s an undue risk inherent in pursuing a creative career, or that success in an artistic field has more to do with magic than hard work. As with the food we choose to eat, it is critical for consumers to understand where art and culture come from, to connect with the producers who make these cultural goods and services directly at the source. In order to begin to change buying behavior, we need to better understand the consequences of our consumption choices and to get to know the artists behind products we use and admire. To that end, we need access not only to artists’ products, but also to the labor and processes that allow them to create that work. By borrowing the community supported agriculture model completely and intact, it has been possible not only to adapt the economic benefits of such a scheme for artists’ sakes, but also to tap into a large audience which is already accustomed to buying directly from other kinds of local producers, and which already has a demonstrated interest in educated consumption and the power of intentional, conscious purchases. The cultural CSA our organizations have tried in Minnesota is just one example of a burgeoning grassroots movement marked by new models of arts support that propose to change the economic paradigm for artists and cultural workers around the country. Crowd-sourced financing of creative projects is gaining momentum with artists and consumers alike, both through online platforms and through community-based programming. Websites like IndieAGoGo.com and Kickstarter.com allow producers to create project campaign pages and to connect with financial supporters online, brilliantly blending consumer enthusiasm for social media and micro-lending. Etsy.com has created a virtual marketplace where makers of handmade goods can set up shop so that consumers can easily find them, based on the type of work made or location. The 3/50 project, launched in 2009, encourages consumer support of local, independently owned, bricks & mortar retail businesses by asking participants to make three purchases of $50 or more to stimulate their local economies. Artist-led initiatives like INCUBATE (Institute for Community Understanding Between the Art and the Everday) Chicago run programs like Sunday Soup, a meal-centered community-based funding platform for artist projects. This model allows guests to buy both a meal and a ballot for $20: guests may then vote on artists’ projects over the course of an evening’s dinner, and selected artists go home at the end of the evening with a bag of cash donated by their neighbors and friends. Most such events grant between $250 and $1000 to individual artists’ projects. And these meal-based, micro-grant programs are springing up in cities across the country: programs like FEAST (Funding Emerging Artists with Sustainable Tactics) in Brooklyn and Kitchen of Innovation in D.C. are part of a growing network of small, community-based, ad hoc giving groups in which anyone can participate, either as a grantee or as a arts patron. While the benefits to the artists are clear, these types of initiatives also respond to an as-yet unmet desire felt by arts-hungry communities, too: access. As with community supported agriculture, facilitating direct relationships between residents and local cultural producers invigorates the connection consumers have with the arts in their area, by building deeper understanding of the art work made there and with the practicing artists who live in their neighborhoods. This is not just about finding more money for independent artists, although that is critically important. The real benefit of grassroots arts programs like these has to do with celebrating the industry, talent, and creativity inherent in each and every community. Culture is not just something that comes, pre-fab and mass-produced, from Hollywood or New York City. Art and artists are the soul of every town—sometimes, local culture gives visitors a reason to come, but even more often, it’s why people come back to stay. When you build consumers’ appetite for local art and the work they do, you improve artists’ lives, certainly, but you also get to the heart of what it means to love where you live. 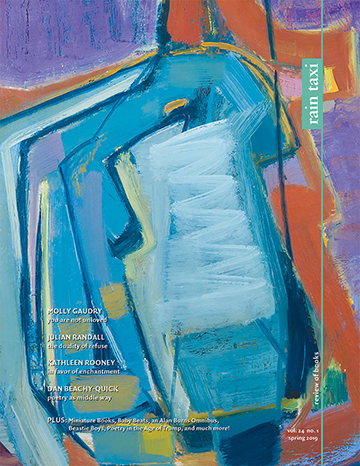 Click here to visit mnartists.org and find out more about the CSA project!